Though early brushes of our country came from Han, Tang-style brushes of Nagaho were introduced by the priest Kukai, who learned the methods to make them in China. He is said to have had Sakaina Kiyokawa of Imai in Yamato Province make brushes following the newly-introduced method, and presented them to the Emperor Saga and his crown prince. The offspring of Kiyokawa engaged in brush making in Imai but later the center of brush making moved to Nara, where there was a large production of Sumi (India ink) and a high demand of brushes by temples and shrines. Kukai's brush had its core made of tight-rolled hemp paper. The core is then covered thinly with hairy cloth. It is called Makifude. Brushes without a core, which are used today, were first made in Genroku (1688-1704) of the Edo period. Hosoi Kotaku invented Suihitsu, which is made of hard and soft hair mixed and glued into one. Then this style spread, resulting in the manufature of such brushes in many parts of the country. Later other types of brushes called Sabakifude were invented as calligraphy got more popular. 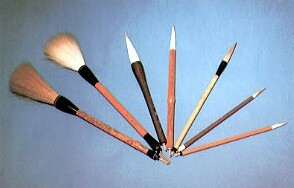 Now there are hundreds of types of brushes: large and small, long and short, and soft and hard according to the writing styles. In October 1977, the Minister of Trade and Industry designated Narafude as ""Traditional Art Craft"" according to ""the law on promotion of the traditional craftwork industry."" Unlike Sumi, this type of brush is also produced in Hiroshima, Aichi, Sendai and Niigata, which are major places of production other than Nara nowadays, but Nara is still well-known to be the original place of writing brushes of our country, high-quality goods being its main products. 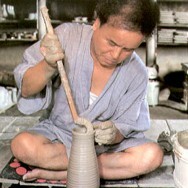 Sumi making is well reputed as a traditional industry in Nara. 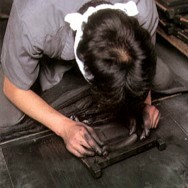 Its history and the large production of today's Sumi make it unique to Nara. Sumi is classified into two kinds: one is ""Shoenzumi"" made from burned resin and the other is ""Yuenzumi"" made by burning rapeseed oil, sesame oil or paulownia oil. 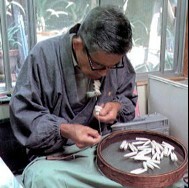 The manufacturing process of the so-called Nara Sumi, equivalent to Nanto-Yuenzumi, was brought back by Kukai together with writing brushes when he returned from China as Kentoshi (delegate). In Japan Sumi was first produced at Nitaibo of Kofuku-ji Temple in this method. Though Shoenzumi was produced even after the Fujiwara era in Kishu (Wakayama today) and Omi (Shiga), it was not produced any longer after the Kamakura period.(1192-1333). 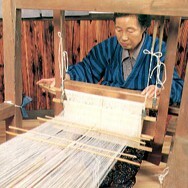 Nara Sumi, which was made at Nitaibo, was given a reputation by Matsui Dochin (founder of Kobaien), who also made it into business of private sectors. From then on, one factory was built after another in Nara, which attracted high technology and skilled workers from all over the country, resulting in the decline of other production cities. Nara boasts 90 % of its national production today. The lacquerware technology of our country reached its zenith as part of the Tempyo culture, which flowered together with Buddhism. 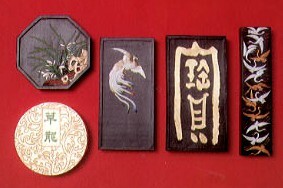 This art was a mixture of various techniques including those seen in painting with lacquer, Raden (mother-of-pearl work), Hyomon (pasting thin gold or silver plates on lacquer surfaces),etc. All this created very beautiful eye-catching products.Probably, craftsmen of lacquerware came from China when finished products were imported, and they taught their technology in Japan. Many pieces of that age are kept at Shosoin Storehouse in Nara, so Nara is thought to be the birthplace of Japanese lacquerware. In the Middle Ages, Nurishi (japanner), Urushiya Za (Japanners' union) came into being. Living and working at temples and shrines in Nara as building japanners, these technicians also made lacquer dishes. Some were masters of tea ceremony utensil japanning, while others worked on soldiers weapons. Later in the Meiji era (post-feudal age) Nara Expo Company was founded, and the First Expo (1876), where precious furniture of Shosoin and other temples and shrines were exhibited, encouraged lacquer painters in Nara to make replicas of the displayed objects, which led to the restoration of Nara lacquerware. 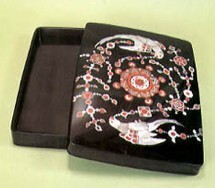 Of all kinds of lacquer technologies, Raden-nuri (unique japanningmethods in mother-of-pearl work) is seen exclusively in Nara. 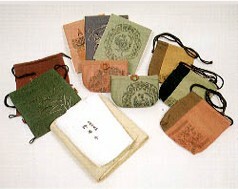 Fans of Nara are famous for their exquisite openwork done with beautifully dyed Japanese paper. 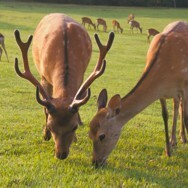 For their patterns, representative things of Nara such as deer and wisterias are mainly adopted. Their elegance has been admired by people since olden days. It is said the Nara fans originate in ones handmade by priests of Kasugataisha Shrine on the side. 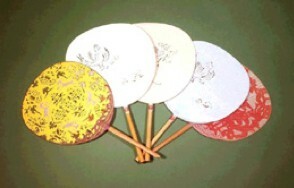 However, the fans made at that time were practical ones finished with persimmon lacquer, not artistic ones like today. It is said that openwork was employed during the years of Ouei. People say that the first openwork fan was made by a monk of Gotain of Kofuku-ji Temple, or a fan manufacturer named Zensuke Iwai started producing such fans. In the mid-Edo period, Yanagisawa Gyozan, the owner of the Yamato-Koriyama Castle, invited china artists, Inosuke and Jihei from Kiyomizu, Kyoto, to rekindle the ceramic industry, and he protected and promoted the industry by exclusively using its products. People like Aoki Mokuto, a court doctor,who gained the title ""Mokuto"" by presenting Rakuyaki ware to Lord Gyozan, and Okuda Mokuhaku, who produced many masterpieces while managing a fancy goodsshop in Yamato-Koriyama City, made Akahada pottery popular nationwide. Today some artists try to give new perspectives to this technology, which is still loved as a native art of Nara. No literature shows the start of “Hornwork” in Nara, but its relatively new record is indicated in “Nara Meisho Shirube” published in 1895. Its illustrations depicting “Hornwork” show “kiserupipes,” “rosaries,” “sword racks,” “combs” and “ornamental hairpins.” This tells that hornwork products have been sold as souvenirs in Nara since the Edo period. Until around 1945, the stores selling hornwork in Nara were called “Tsunoya,” which means such products were massively produced. They sell a wide variety of products such as “sword racks,” “chopsticks,” “combs,” “spatulas,” and “ornaments.” Since the Edo period, many of them have been loved as articles of taste. In recent years, craftsmen specialized in “Hornwork” have been reduced year by year, and there are some only in Nara now. 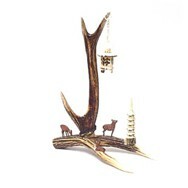 This is because deer horns are easily available as materials in Nara. Since 1945, contemporary products including “brooches,” “pendants,” “bolo ties,” “cuff links,” and “obisash clips” have been produced. On the other hand, traditional products such as “ornaments,” “spatulas” and “chopsticks” are still manufactured as craft works or specialties of Nara. Though the origin of Nara Sarashi goes back to the age of Kojiki, or Records of Ancient Matters, it only became widely known in the early Edo period. Then a man named Kiyosumi Sishiro improved this bleaching technology and gave it a sudden popularity. Until then Sarashi was mainly used for the clothing of priests and later of Bushi (warriers) as the material of their formal suits. Nara Sarashi manufacturing came to be such a big business that Ieyasu Tokugawa picked a habit of using it regularly and had to enforce a law to control its production and sale. Nara Sarashi sees the completion of its white color and cool touch in the clean stream in the mountains after its pre-refined cloth is carefully woven from hemp thread for about one month. Therefore, Nara Sarashi is said to be given life by water running between mountain rocks, while quality cloth of Echigo is considered in need of good snow. Because of its clean and elegant texture, it is used not only for the costumes of traditional performing art but for tea ceremony cloths, table centers with designs of treasures at Shoso-in Storehouse, and Noren (cloth dangling at the entrance to a Japanese restaurant). Masks for Japanese classical music first came from China in the early 7th century (at the reign of Empress Suiko) as part of Buddhist art. Most of them are kept at temples and shrines in Nara today. The first masks to come were ""Gigaku-men"" for Gigaku (ancient mask show), replaced later by Bugaku (court dance and music) masks called ""Bugaku-men."" They were followed by ""Gyodo-men,"" which were used at religious events and processions (Gyodo), through which Buddhist merits and ecstacy were given widely to the general public. 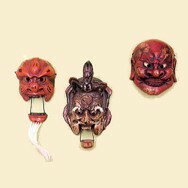 In the 11th century, as Nohgaku and Kyogen occurred and developed, uniquely Japanese masks were created. It was not until the modern age that these masks were imitated and made objects of artistic appreciation. 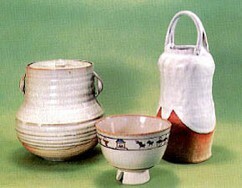 Especially after the Second World War, they were no longer mere souvenirs of Nara, but came to be seen as art works of interior decoration and even sold at places like department stores, since people reconsidered ancient fine arts unique to Japan and found them full of conspicuous values. 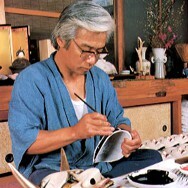 Some artists are active in Nara, making wooden masks usable at Noh and Kyogen stages. The colorful dolls that decorated Hanagaza (a hat adorned with flowers) of Den-gaku Hoshi (a performer of ancient ritual music and dancing) or Shimadai (an ornament on a stand representing the Isle of Eternal Youth) at Kasuga Wakamiya Festival, which started in late Heian period, are the first forms of Nara Dolls. 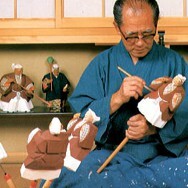 Afterwards, doll making developed as accessories to ceremonies of Kasuga and other shrines. It made rapid progress in the Azuchi-Momoyama period. During this time such rulers as Nobunaga, Hideyoshi and Ieyasu received gifts of dolls from various parts of the country. And ""Tamon-in Nikki,"" or the diary by Tamon-in, says the foremost one from Nara was the Nara doll used for Noh performance and that it decorated wine tables, which were also beautifully colored. This was the time when ""Sarugaku Noh,"" which originated in Sangaku, the oldest form of performing art of Chinese origin, established itself as Nohgaku. 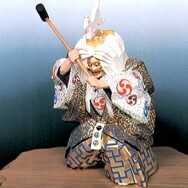 Accordingly, Nara dolls, which were for the most part Noh dolls, took their original form. Around the mid-Edo period, Okano Shoju, whose family had been of doll manipulators for 13 generations, gained Nara dolls fame. And from late Edo through Meiji, Morikawa Toen, who was also a kyogen performer, enhanced the quality of Nara dolls to the level of an art. Since around this time, Nara dolls have been called ""Ittobori"" (one cutter carving) and have been used for Kyogen like ""Takasago,"" Bugaku like ""Ranryo-oh,"" animals of Junishi (Oriental Zodiac), but currently, Hina dolls are quite popular as well. Nara dolls' charm lies in the mysterious harmony of their simple figure and their extreme but meticulous colors. Lately original artists of Nara dolls have appeared.